This is late this week as I was dealing with my Haircut From Hell and did not get around to reading many blogs. My haircut aside, take a look at what these lovely ladies posted this past week. How to Retain Length and Grow Long Hair with Wigs and Weave Longing 4 Length: Ebony shares some great tips for using wigs and weaves to help retain length and grow your hair long. If I ever need advice on wigs or weaves I know she is the first person I would turn to. Quick Curlformer Tutorial Brown Girls Hair: I follow both relaxed and natural hair blogs because I think we can still learn a lot from each other. This Tutorial is on natural hair but can be used even if you are relaxed. 5 Ways Social Media Can Tank Your Job Interview.......Before It Even Happens! The Martini Chronicles: This professional diva shares some Social Media don’ts for people who plan is to get hired. 25 Popular Oils, Butters and Natural Ingredients and How to Use Them on Natural Hair Black Girl Long Hair (BGLH): Another post that I can benefit us relaxed ladies also. Relaxed or natural, we basically use the same oils and ingredients. Going Natural: How to Help Friends Decide Longing 4 Length: Monet gives some tips on helping your friends and family decide on going natural but these tips can apply to anyone wanting to help friends and family take better care of their hair. 5 Tips To Help Edges Bounce Back Just Grow Already: Jeni has one of the most beautiful head of waist length relaxed hair that I’ve come across. Check out her tips for one of the most common hair problems. 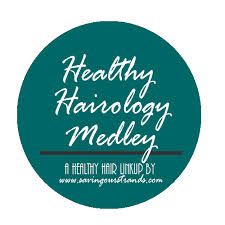 Visit the ladies over at Saving Our Strands for more on the Healthy Hairology Medley! Thanks for linking up chica!